What a great time at Roxy & Dukes in Dunellen, NJ, this past April 9, 2017. 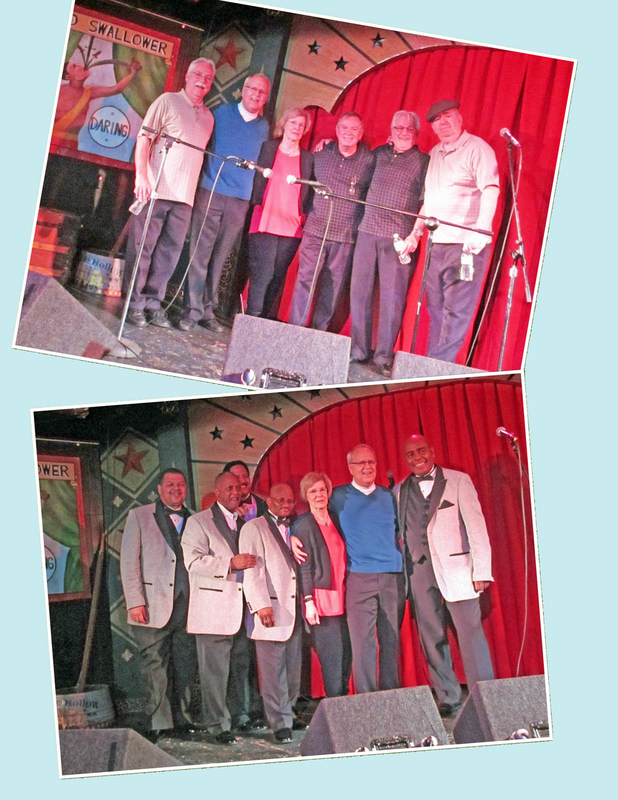 It was all-Philly night as we welcomed two great Philadelphia acappella groups, 5/3 Woodland and Quiet Storm. 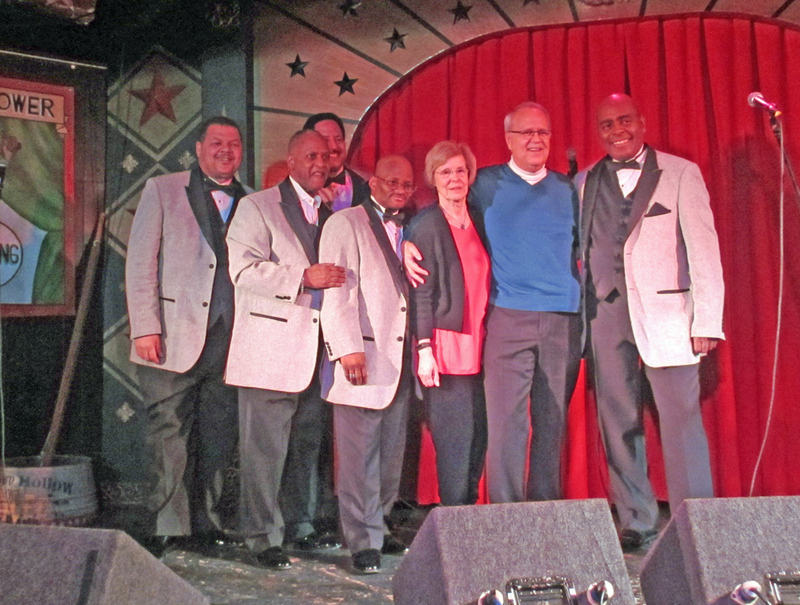 Both groups had performed at Roxy & Dukes before and we were thrilled to have them back. 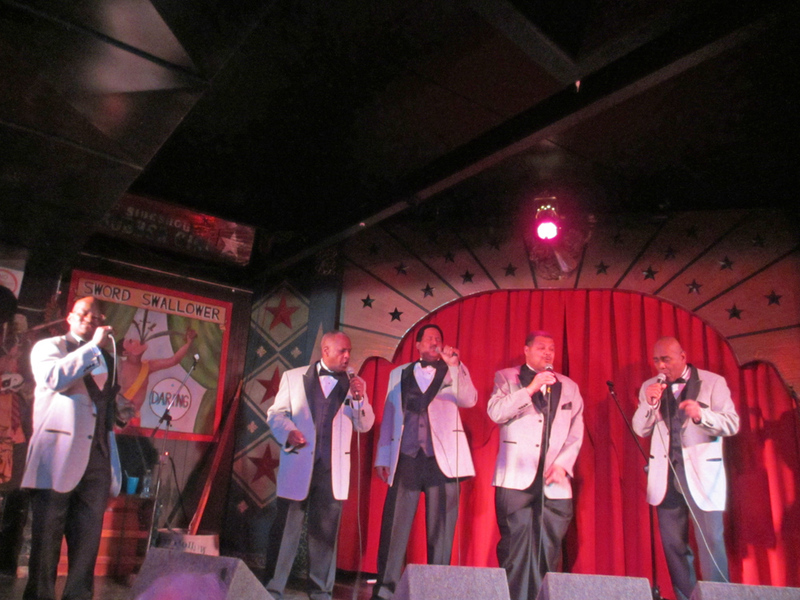 5/3 Woodland started things off with a rousing rendition of “Good Old Acappella,” an appropriate start for our 22nd acappella doo wop show at Roxy & Dukes. The group from Southwest Philadelphia (53rd & Woodland to be exact) gave a perfect mix of up tempo songs (“Johnny Johnny,” “Who’s That Knocking,” Babalu’s Wedding Day,” “Sixty Minute Man,” “Runaround Sue,” “Come Go With Me”) and ballads (“Long Lonely Nights,” “Heart’s Desire,” “That Boy,” “Where Or When”). We especially loved hearing 5/3 Woodland’s version of “Countdown To Love,” the song from the movie “Streets Of Fire”. 5/3 Woodland’s harmony was exquisite and their performance was made all the more entertaining by Joe O’Donnell’s hilarious comments and stories. 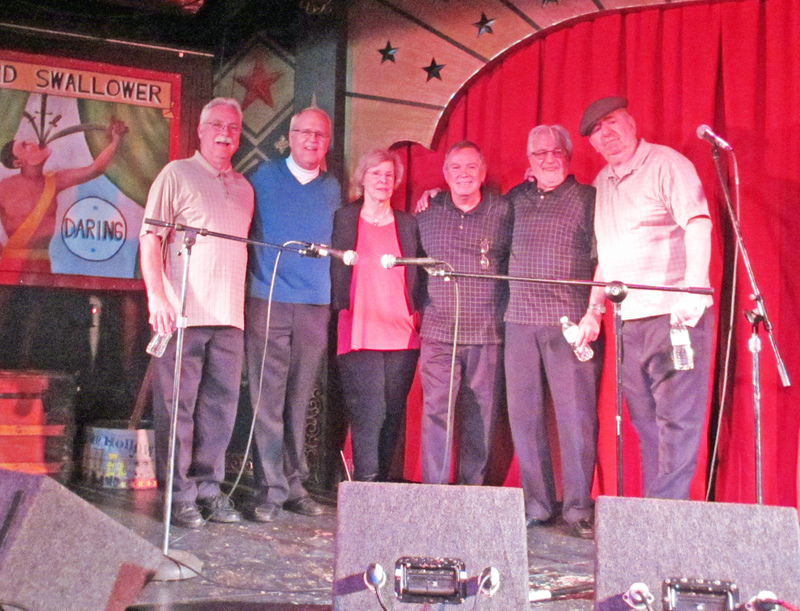 The tale about the group once performing “Chain Gang” while marching in the Philadelphia Mummers Parade with microphones tethered to a moving float had the audience in stitched (watch the video, below). 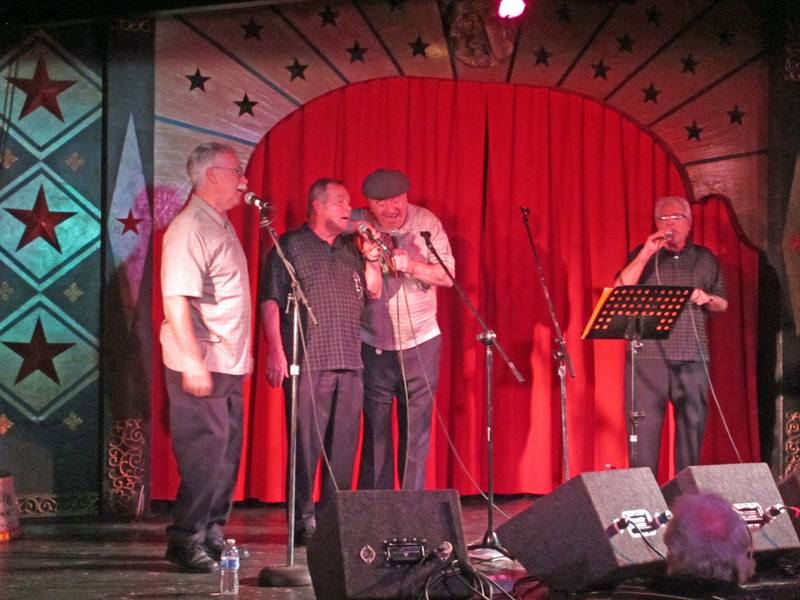 Our sincere thanks to Joe O’Donnell, Tom Tait, Al Loughead and Frank Mariorano for an outstanding set. 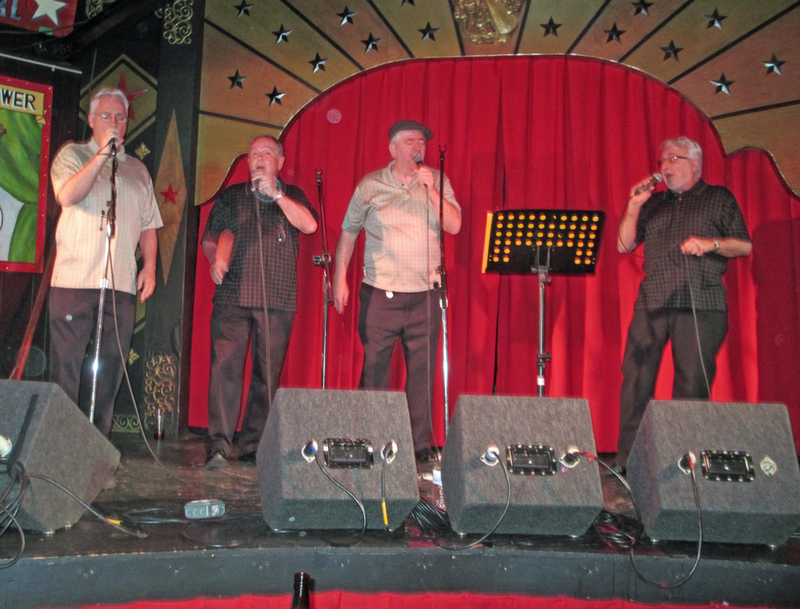 Quiet Storm was a last minute, but much welcomed, substitution for Echoes of Time, who could not make the show. We are truly blessed to have a group of Quiet Storm’s caliper there to help us out. 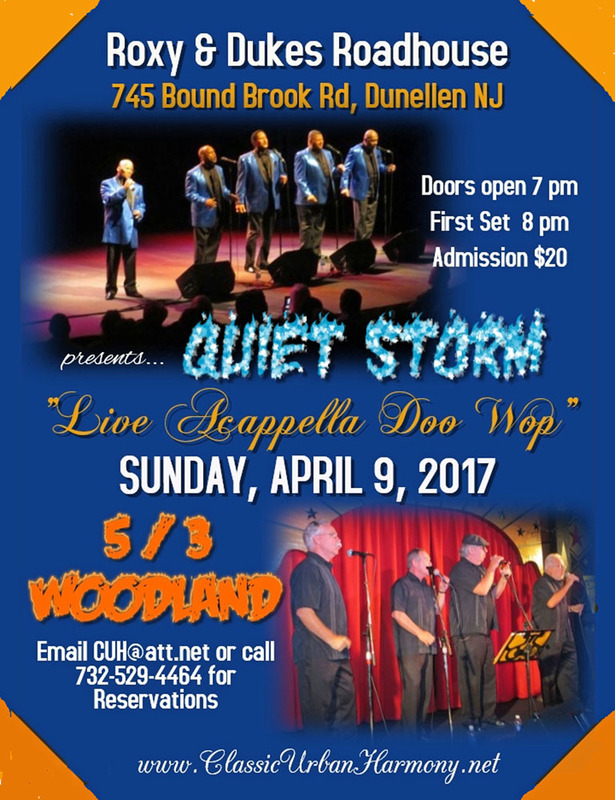 Quiet Storm again demonstrated why they are among the top vocal groups around. 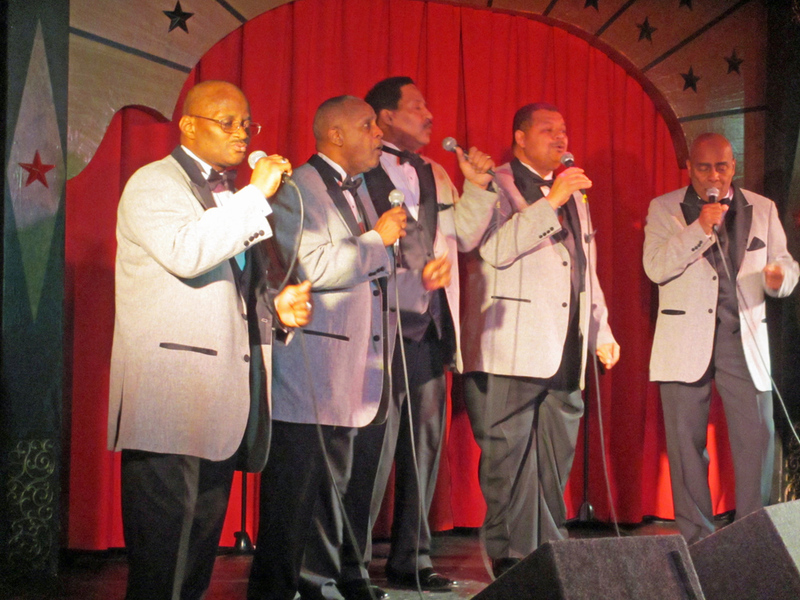 They began with the Moonglows’ “Sincerely,” followed by two Platters’ songs: “Only You” from 1954 and “I Love You A Thousand Times” from 1966. It was classic Quiet Storm with each member taking lead, depending on the song. Smitty’s booming bass voice led “Zing Went The Strings”. 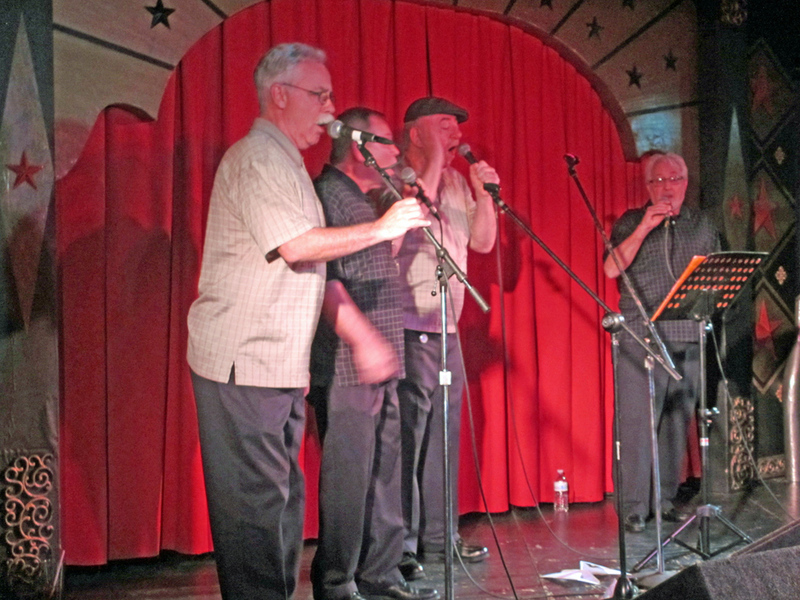 James led “Fools Fall In LOve” and a great slow version of “Unchained Melody”. Skip really nailed “If I Remember To Forget”. 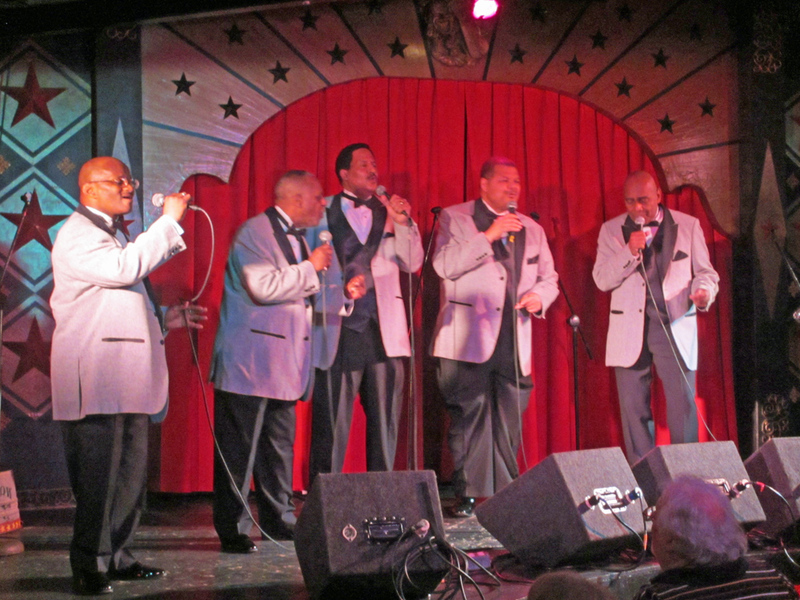 Ron’s powerful voice took the lead on the Blue Notes’ “If You Don’t Know Me By Now” and “Everybody’s Got A Home But Me”. Nix was just as powerful on the Magnificent Men’s “Peace Of Mind”. Nix also gave a dramatic recitation of “Sweeter Than The Berry” ( a Bunny Sigler song). Many thanks to Kamau “Smitty” Akiba, James Phillips, Ron Silva. William Nix and Madison “Skip” Gullett. Here are some photos and a few YouTube videos of the event. Click on any photo to enlarge and then use the side arrows to see others.